If you like the free browser-based version of Geometry Expressions, you should try the full version. It's not free, but it's well worth the money, here's why. You can build larger more complicated models with varied styles, hidden items, and you can save the models. You can export mathematics in the format for a variety of different CAS systems, along with Tex and MathML. You can export mathematics as computer source code in a dozen different languages. 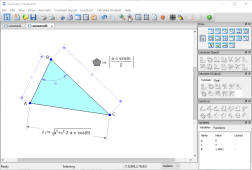 See how you can use Geometry Expressions for mathematical modeling, app generation and code generation. First take a look at how constraint based geometry works, and how it enables you to generate mathematical models. 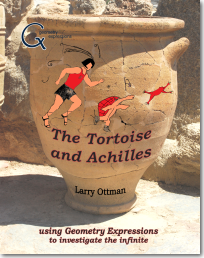 Browse our range of books about Geometry Expressions. Some are collections of lessons, suitable for photcopying and handing out to your class. Others are extensive collections of examples. All are available in printed or electronic form. We highlight a number of projects done by students using Geometry Expressions. 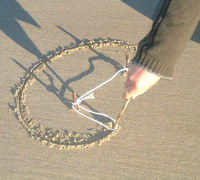 We present a number of activities which can be attempted with Geometry Expressions. 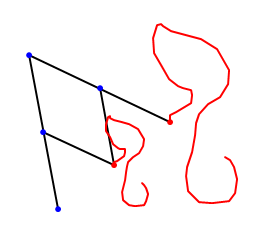 Our companion site Euclid's Muse contains hundreds of apps generated by Geometry Expressions. You can even post your own apps to Euclid's Muse. Math Illustrations is a lite version of Geometry Expressions without the symbolic features. It is useful for illustrating mathematical problems, or for doing geometry numerically. 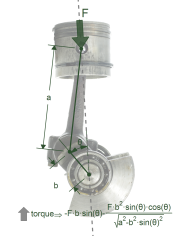 Mechanical Expressions adds physical properties such as force, mass, velocity and acceleration to you geometry model. It allows you to get symbolic results for reaction forces and equations of motion. You can even create dynamic simulations as apps.